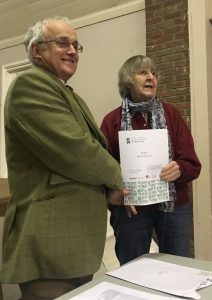 Photograph shows the Parish Council Chairman (Mr. P. Kirton) being presented with the Local Council Award Scheme’s Certificate at our January 2017 meeting. The Award demonstrates recognition and respect of the commitment and hard work of the councillors and officers to ensure that it has in place the required documentation and information to operate lawfully and according to standard practice and ensures that the council is delivering to a national professional standard. (The Local Council Award Scheme has replaced the Quality Council award – status to which was obtained by the Parish Council in 2011).